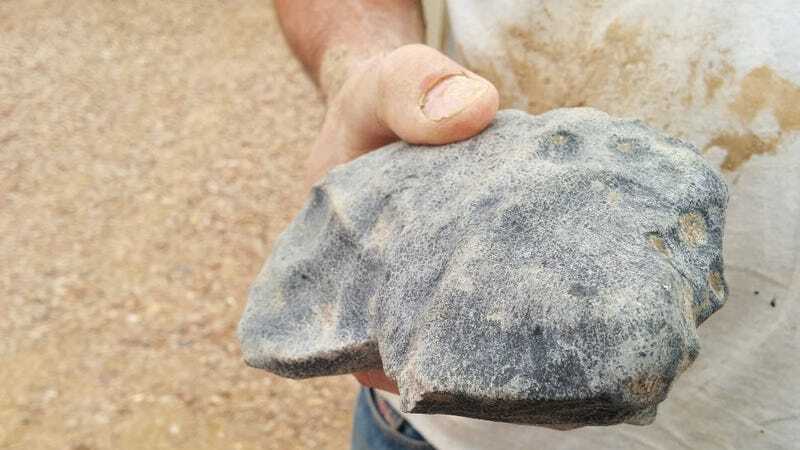 Geologists working in Australia have recovered a primordial meteorite that fell to Earth this past November. Using an extensive camera system and some pretty sophisticated math, the researchers recovered the 4.5-billion-year-old rock just moments before heavy rains would have washed it away. The meteorite, which fell to Earth on November 27, 2015, was witnessed by a number of locals in the William Creek and Marree areas. Importantly, the rock’s descent was also tracked by Desert Fireball Network cameras, an array of 32 remote camera observatories stationed across the Australian outback. Using this footage, DFN team members conducted image analysis, triangulation, and other calculations to get a sense as to where the meteorite had fallen. Estimates placed the location in the outback near Lake Eyre. The recovery operation was equally complex. It involved an aerial spotter, a remotely operated drone, two searchers on the lake’s surface, and guidance around the area by local inhabitants. Remarkably, after a three-day search that started on December 29, 2015, the researchers found the 3.7-pound (1.7 kg) rock embedded in thick salt lake mud, and covered by soft wet mud that accumulated on the meteorite after its impact. It was found partially buried in a 16-inch hole (42 cm) in a region more than 3.7 miles (6 km) away from the lake’s edge. Had the researchers arrived a few days later, any trace of it would have been wiped away owing to heavy rains. “It was an amazing team effort—we got there by the skin of our teeth,” noted Curtin University’s Phil Bland in a statement.